Guardians of the Galaxy was a financial and critical success in 2014, but three years ago, the chances of a non-comic book fan having heard names like Peter Quill and Groot were slim to none. Heck, there were likely many comic book fans who didn’t know who these characters were. Thanks to director James Gunn and his team, this band of troublemakers are now household names. However, while Marvel has a expansive library of characters at their disposal, there were several that they didn’t allow the director to include in the space shenanigans. During an interview on The Movie Crypt podcast (via Comicbook.com), Gunn was asked by a listener which characters he wanted to use in the film, or possibly its sequel, but wasn’t legally able to, and he listed off two obscure extraterrestrials from the Marvel pages. Yes, even more obscure than the titular characters. "There was a really good chance Bug was going to show up in the first movie but we do not own him... but, anyway, that was going to happen, perhaps. Listen, I really love Rom: Spaceknight, as everyone at Marvel knows because they've given me Rom stuff... but we don't own Rom. I would love for Rom: Spaceknight to show up because I love his story, I love the way he looks, I love everything about him…"
Rom: Spaceknight is a cyborg warrior from the planet Galador who protected Earth from the shapeshifting Dire Wraiths. Rom was originally a toy sold by Parker Brothers, and in the late 1970s they licensed the character to Marvel for a comic book series. Because the licensing deal expired, Rom is unable to legally appear in the Marvel universe, although there have been subtle references to him over the years. 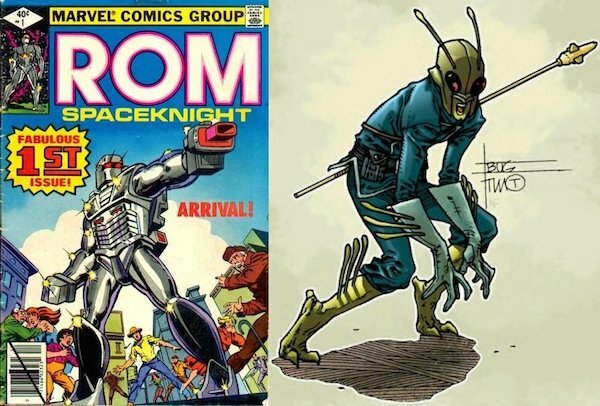 Bug, also based off a toy, is a member of the Micronauts and has also been a member of the Guardians of the Galaxy. Unlike Rom, Bug has appeared in the comics in recent years, so the ownership issues must be different than robotic warrior, such as a different studio holding the film rights. Because of these pesky legalities, it’s unlikely that they’ll suddenly become available for Guardians of the Galaxy 2 in the coming years, but don’t worry, we’ll still see new faces joining the ranks in 2017. Gunn was also keen on using the alien species Badoon for Ronan’s army, but because 20th Century Fox has the film rights to them, he was forced to replace them late in the process with the Sakaarans as the "cannon fodder." Between them and the Chitauri from The Avengers, entire alien races might want to be careful about going up against MCU heroes. They may have the numbers, but they’re still going to lose…badly.